Heinen & Hopman Engineering was founded in 1965 in the Netherlands as a family business by Melis Heinen and Cees Hopman. Known for their business integrity, these two men combined a customer-oriented approach with products that quickly became renowned for their reliability and quality. Over the years, their rich experience and entrepreneurial spirit have combined with the dedication and skill of their employees to transform Heinen & Hopman from a local Dutch supplier into a world leader in the complex HVAC sector. The company now has offices and workshops in 20 countries. For its first eight years, Heinen & Hopman specialised in the design, engineering and installation of air conditioning, cooling, ventilation and central heating systems in buildings. As the company grew and gained recognition for its onshore activities, in 1972 the company started receiving inquiries from the commercial shipping industry too. Having the know-how and adaptability required for these projects, Heinen & Hopman took on more and more work within this sector. 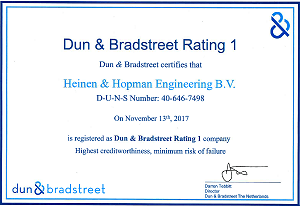 As orders from the shipping industry increased and Heinen & Hopman began to approach different segments within this market, the company quickly gained an excellent reputation in the sector. Other industries also started calling on the company, including offshore, yachting and the navy. 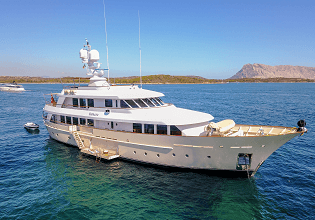 In no time, leading yards at home and abroad were partnering with Heinen & Hopman, and what started as a few simple inquiries for air conditioning installations onboard commercial ships soon became requests for advanced systems for state-of-the-art navy vessels, superyachts and offshore platforms. In no time the company had started designing and manufacturing its own products for marine applications (with FAT) and Heinen & Hopman as we know it today was born. 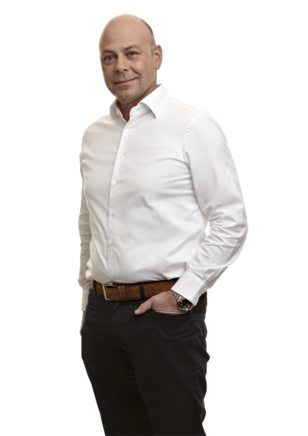 Heinen & Hopman has become a leading specialist in the maritime sector. We provide world-class quality and service in air conditioning, ventilation, central heating, refrigeration and mechanical ventilation, and have supplied over 10,000 vessels worldwide. The no-nonsense and entrepreneurial spirit of the employees who founded the family business in 1965 continues to pervade the company today. At the same time, Heinen & Hopman is renowned for thinking ahead of the curve and coming up with genuinely innovative systems and solutions. Whatever the environment in which the vessels we supply will be sailing, our knowledge and expertise ensures the most suitable indoor climate. We deliver customised or standard solutions to suit any situation. In close cooperation with our customers, we realise innovative solutions for the design, engineering and installation of tailor-made maritime climate systems. Heinen & Hopman ensures the perfect indoor climate on all types of vessels. With our comprehensive knowledge of the maritime sector, we can guarantee you the best possible solutions that incorporate the very latest technologies, including in the field of energy saving and sustainability. In the current economic climate, financial strength and stability are very important for all stakeholders considering doing business with each other. 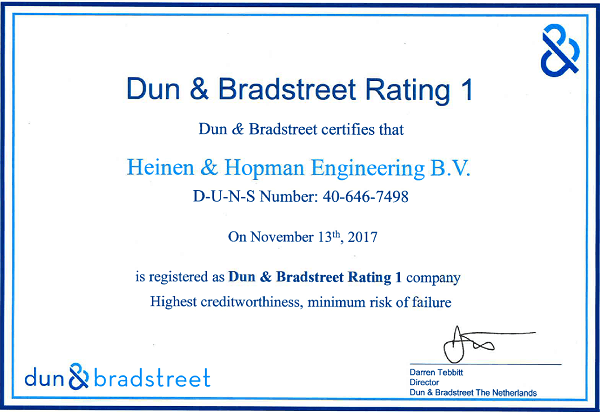 The fact that Heinen & Hopman has been nominated for the D&B Rating 1 for many years, indicates our high degree of creditworthiness. Moreover, Heinen & Hopman has been a family owned and continuously growing business since 1965. With technical knowledge, local know-how and an ability to adapt, we have consistently proven ourselves to be a strong and reliable partner. Like our clients, Heinen & Hopman has a worldwide presence and is constantly evolving. Our ambition is to continue to grow in the global market of maritime climate solutions in a future-proof way. This is why innovation and R&D are at the heart of Heinen & Hopman’s strategy. We believe that the key to success lies in offering our clients top-of-the-line products and services, while at the same time listening to their individual ideas and requirements. Global networking is crucial in every line of business and the shipping industry is certainly no exception. Being able to offer the highest quality of service and products to our clients at all times and in all places is of enormous importance to us. This is why Heinen & Hopman aims to keep expanding our network and know-how and ensure we are exactly where our clients need us to be. Dedication to our customers with top service, high quality products and sustainable, innovative technology is our number one priority.